The Classic Cartoons shown in the 60s gave you the historical Flinstones or the futuristic Jetsons. 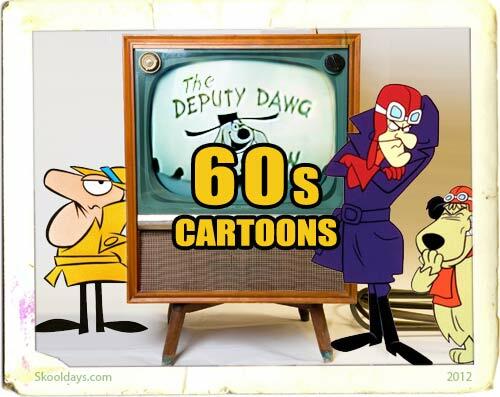 Other 1960s cartoon shows included Deputy Dawg, Scooby Doo, Popeye, Quick Draw McGraw, Josie and the Pussycats, Wheelie and the Chopper Bunch, Batman and Alvin and the Chipmunks. Take a look and discover more cartoons favorites. This entry was posted in Cartoon and tagged 1960 by Skooldays. Bookmark the permalink. anyone ever hear of mervie vomo.the little hobo. Popeye the a Sailir ge is my favorite idol & popular superhero eats san of spinach to save Olive Oyl from Bluto & saves the day. I wonder if you can help me. In the 1960″s there were five minute cartoons from Europe that were put on BBC1 around the time of “The Singing Ringing Tree”. I have tried to look for them and ended up on your web page. If you know of them, would you be able to let me know what they were called and if there are any links to them. Popeye he is my idol & my favorite superhero eats can of spinach to save Olive Oyl from Bluto & saves the day. I am the big fan of classic cartoons in popular culture in TV films comics animation & media throughout the world.